Olympic fever has swept the world again, reminding us all just how rewarding perseverance, determination, and a comfy recliner can be while we're stuffing our faces in front of the television. I also like to yell critiques at the athletes during these times, because I enjoy both the irony and the frightened look John gives me when he reminds me the TV isn't on yet. To this I say: "P'FFAW!" (It would have been "P'SHAW," but my mouth was full.) I don't need to actually WATCH the Olympics to get in the Olympic spirit! Technically those are supposed to be rings, though. Feel the spirit, y'all. Woo. Go. Win. Or whatever. Or is it peanut brittle? Nah, that's totally Scrapple, in my book. I don't know if this was supposed to be an Olympic cake or not, but let's just assume it was so I can keep laughing, k? I especially like how the baker added that poo-like rope border for accuracy. Um... What is this supposed to be, again? Right. Back to the rings, then. HISTORY FLASH: According to Wikipedia, the repository of all knowledge that is accurate and true, (Est. 1904), the Olympic Rings were designed in 1912 by Baron Pierre de Coubertin, who stated that their colors represent "the colours of all the nations, with no exception." After that it seems almost petty to point out that there's not supposed to be an orange ring, but what can I say? I'm out to make Tom proud. And I won't. back. down. Also, I'm pretty sure this wreck's days are numbered. Incorrectly. Thanks to Marcy B., Julie S., Amanda M., Liz, Beth K., Charlene, Angi H., Melissa R., & Callie B. for catching Olympic fever with me. Feel better soon, guys! That isn't scrapple, it's nougatine. Nougatine is almond brittle, and it's delicious. It's traditionally used like this, to make an edible container for a filling, and it's also used to make the base for a croquembouche. Happy no sharp birthday! Almost missed the Tom Petty reference. 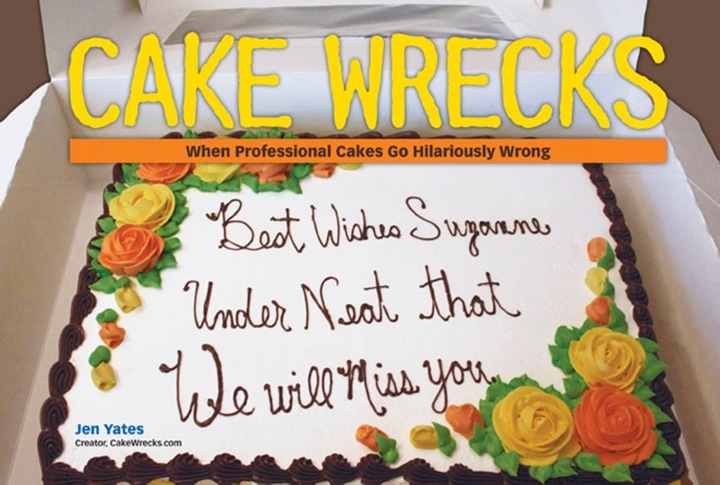 I still think the second cake is the worst, because it takes someone more literal-minded than Sheldon Cooper to think the customer wanted that. Ah, Jen. You always make me laugh, even against my will. I was determined to be in a terrible mood this morning, came to read this, aaaaand.... nope. Laughing. What a great idea! From now on, all my birthday cakes are going to say "Happy No # Birthday!" Let 'em guess. It's my [no number] birthday later this week, and I plan to celebrate with ice cream cake. August 6, 2012 | Susanna K.
Boy, if I'd known you could get a No # birthday cake, I'd have gone for it. Although, I suppose then someone would feel the urge to put all the right number of candles on the cake and we'd to have called the fire department. It's cool today so I'm going in the kitchen to bake-but probably bread, not cake. Technically, the "Olympic Dots" are in the correct order as well. However, that doesn't change the fact that they are also technically dots. The cake with multiple rings that look kind of like onion and pepper rings should have been on a baked cheese colored frosting. It might have made a passable pizza cake. My birthday was yesterday. Now that I am officially over 30, I would have LOVED the "No #" cake. I mean, does there really need to be a number? No... no, there doesn't. Ah, my old nemesis ("Olympic Rings"). I knew we would meet again. Since I'm on planes all day, in lieu of a song, imagine a spot-on parody to "Single Ladies" (Put a Ring on It) with the refrain "If you want Olympic cake then put some rings on it." I'm sure you'll do brilliantly. You just had to say "scrapple" while I was eating breakfast, didn't you? *sigh* Does anyone want the rest of these eggs? And, to chime in the weight cake... 3kg is something like 6 1/2 pounds? It's funny to me that they just slapped a number on the cake without a simple Google check of the conversion. Love the "olympic weights" wreck -- not just for how bad it looks, but also the "massive" error on the top weight. 2.5 lbs is NOT equal to 3 kg! Christmas condoms! Just think of all the new decorating possibilities! Had just settled down for a Christmas condom filled nap…. My husband says that the cake with 9 rings is the result of a fight between the Olympic Rings and the Audi Rings, which have eneded up tearing each other apart! *Audi has 4 rings in their logo (husband says). I'm taking this on trust as I'm too lazy to google it! OK, I am also loving the "no #" cake since I am over 50. Woo-hoo! @Leesa: Yes, the Audi logo has 4 rings. But they are silver. And interlinked. Maybe they all got separated during the rumble and can't find their way back. But the scrabble . . . . thing. . . . .whatever it is: As frightening as the particle board/peanut brittle "cover" layer/thing is, I dread the thought of opening this "book" and finding out what's inside. I've never seen a creation like this. The weight wreck: poo-colored weights, some in pounds, some in kilos. Really? What gym do these people work out in? Wooo! Have been waiting on an Olympic post since the opening ceremonies. Thanks for not disappointing! That "olympic rings" cake will always be one my very favorites. That's one of the cakes I describe whenever proselytizing about your blog. The 4th cake looks like someone wanted a Harry Potter cake and then unfortunately had to describe the Quidditch rings to a Muggle. You are so encouraging, but you are truly indispensable. I, for one, would never have the hubris to try to take your place. I needed the laugh. I like the Dots. They should go with Olympic Dots instead of rings. I like the idea of a "no pound" birthday cake. Eat all you want. On the scrapple cake, what are the rings made of? Seriously, these wrecks make me look like a good cake decorator, and my skills compare unfavorable to the average grade-schooler. I'm thinking the last cake is maybe a cake for the Gay Games -- the rings are almost all the colors of the gay pride flag. 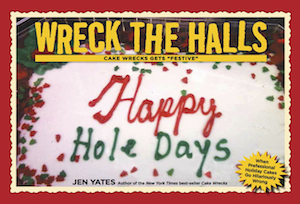 And by saying "Happy No Number" or "Happy No Pound," the bakers are not choosing one particular number or poundage for segregation, but are welcoming of all numbers and poundages. 1) *spin* Left hand Australia. *spin* Right foot Lithuania. Also: mmmmmm, Dots. 3) Hee. "Or whatever" Hee. 4) Aaaaand I just learned a new word. Here I thought it was some sort of magic word like "Yapple-Dapple"! Anyone? Or perhaps what you call it when Scrappy Doo grapples with an opponent? No? Perhaps a new beverage: "Scrapple - made from what's left over after the best stuff on Earth is all used up"? 5) I love your Mad Libs style jokes. 6) I see the "3 Kg" and the "5 Lbs", which is pretty hilarious, but, what is that other black writing? "39L"? "5 (degree symbol) C"? 7) Olypians are from the country Olypia, right? 8) Are there ANY flags with the colors brown and white on them? Okay, I googled it. But Wikipedia gave me a rather looong list of flags "by color....Brown". Would you believe that loooong list includes places like Costa Rica (flag colors: Blue, White, Red), Croatia (flag colors: Red, White, Blue), and Andorra (flag colors: Blue, Yellow, Red). Wow. That is a very acurate list. At least it includes Sri Lanka whose flag does contain a reddish brown color along with green, orange and yellow. I actually thought the "scrapple" one was the frosting used on a German chocolate cake - the stuff with the coconut in it. 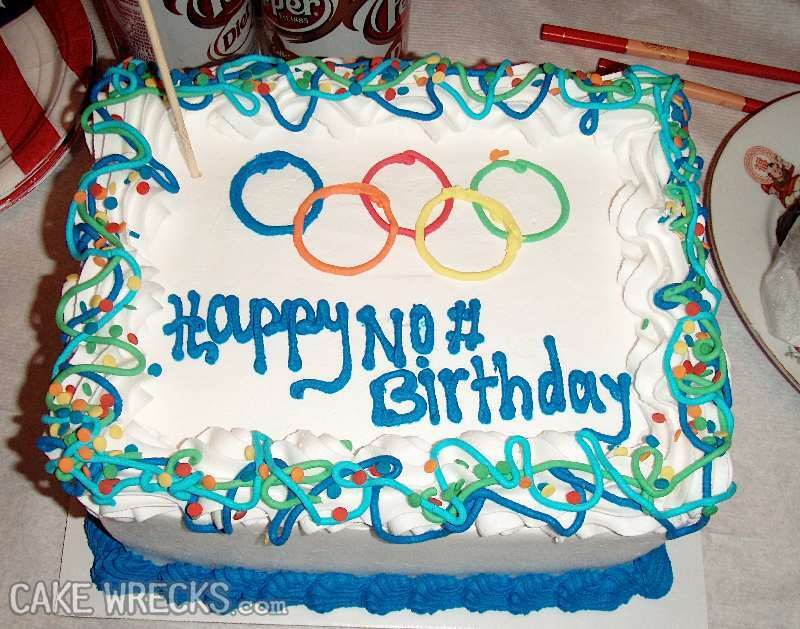 My hubby's b-day was the same day as the opening ceremonies so he wanted an Olympics cake. So I made something very amateurish, but it still looked better than some of these. At least I got the colors right. Also, Baron Pierre de Coubertin must have been thinking of certain residents of New Jersey and Roswell New Mexico when he included the orange and green rings. Good for him for being so inclusive! Yeah, I know, it's about the colors of the flags, not race. Hey, Jen? Did you hear about this Petty Wedding when you wrote today's post? I have always said that I will eat anything made of chocolate ... but even I am going to draw the line at the weight cake. I celebrated my 8th No # birthday in January! Read to the tune of the nursery rhyme "This is the house that Jack built". August 6, 2012 | C.W. cake #5: the not-balloons are neatly lined up around the edge of the cake for the open ceremonies as they march into the stadium. yes, that is exactly what I thought when I saw that. welcome to my world. I was WAITING for somebody to mess up the colors!! #4 I haven't seen Torginol (flooring made from colored chips covered with clear resin) in years. No, I don't know where the name came from. #9 Birthday cake for people on a diet. How thoughtful! I love how the second one has parenthesis AND quotation marks. Finally a no number or pound birthday cake. I can now be 21 again and no one will ever know the difference lol. Plus I can eat a ton of cake and not gain weight. Would love to live in a world of pound free cake. But alas the wreckerators wouldn't let me live there in peace so have chased me with weird looking Olympic cakes. Ah well lol. the orange ring must represent the jersey shore. Obviously they messed up the rings intentionally to avoid being sued by the Olympic Committee. "It's called a salute to (the flag of) all nations, but mostly America, if America had Orange and Green in their flag"
Please forgive me, as I'm way behind the times. But I'm backlogging through what I've missed in the past couple months (I've been busy). I just have to say something. The rings in the "correct" version are not only terribly done, only a few of them are connected. If you tried to pick them up (assuming they were real rings, and not icing), you would get two sets of 2, and a single one. So either connect them or don't, but don't connect some and not others. It just looks silly.